The original Core Temp Gadget, brought to you by Core Temp's developer. The original Core Temp Gadget, brought to you by Core Temp's developer, Arthur Liberman. Monitor your processor temperature, load, frequency and VID settings with a visual representation via a graph at the bottom of the gadget. - Adjust the zoom to change the size of the gadget. - Show or hide the graphs and text fields. 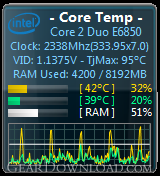 - Graphs can display core load or core temperatures. - Select colors for the cores. Colors can be selected automatically or manually, a different color per core or a single color for all the cores. By clicking on the resize button (dock/undock in Vista) you can quickly show or hide the graphs. 1. Close all instances of the Gadget. 2. In Vista - Restart Windows or Kill the "sidebar.exe" process by using the Task Manager. In Windows 7 - Right click Desktop, View, uncheck "Show Desktop Gadgets". 3. Start Sidebar again from the Desktop context menu (right click Desktop). 4. Uninstall the Core Temp Gadget. This download (CoreTempGadget.zip) was tested thoroughly and was found 100% clean. Click "Report Spyware" link on the top if you found this software contains any form of malware, including but not limited to: spyware, viruses, trojans and backdoors.